Anxious to see this in action I set myself a goal to do this at the first decent opportunity in a retrospective as well. Since I would be in L’viv (Ukraine) visiting our remote teams at the end of May and that the product owner of one of these teams would also be there during one of their retrospective meetings everything fell into place. Ok the time and place was decided now to bring it in practice. First thing to do was to get myself enough LEGO for a team of 4 people. 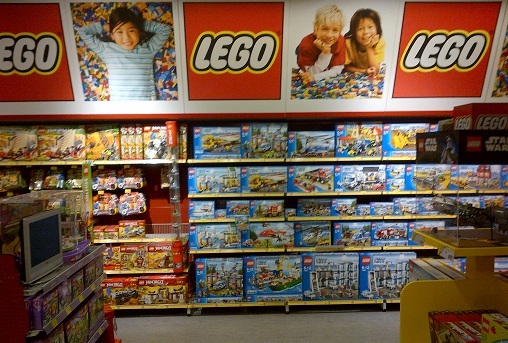 There are some specific LEGO serious play sets on the market (you can find them at, but I decided to go with regular LEGO to start with since there is a lot more choice in available building blocks with that. So I headed to Toys R Us. Not knowing how much I need I just purchased a bunch of sets of wheels, bricks, figures, doors, windows, and some storm troopers of the Star Wars LEGO set (which were hijacked directly by our product owner almost instantly). Next challenge was to get all the LEGO to our remote team in L’viv. Luckily the product owner would be visiting L’viv for just a few days so I convinced him to take a big suitcase with him filled with all the LEGO that I had bought. And in return for that favor he could keep the storm troopers which he had hijacked from the LEGO sets. 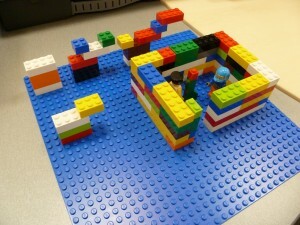 initially the team was a bit surprised when I took 5 cases of LEGO to the retrospective meeting. But they started the meeting as usual by praising each other for the things that went well during the sprint. 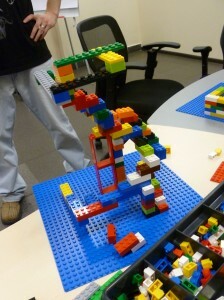 Then when the SCRUM master was going to start with the “Improvements” section it was time to bring in the LEGO. I opened up the boxes and then quickly explained what the idea was behind this exercise. I had to be quick because they almost lost all interest in me and what I had to tell the moment that the LEGO boxes opened up. So what I explained to them is that I would like them to each individually create something with LEGO that represents their current feeling in the team. They looked a bit puzzled but then just started putting bricks together and started building things. To not put too much pressure on them (which in my opinion would ruin the creativity process) I set a large time box for the exercise of 45 minutes. I was really pleasantly surprised by how serious the team took this and saw some nice things emerging from their hands and was wondering what the story behind it would be. When they had completed their constructions I let them explain what it represents one by one while the rest of the team, the product owner and me would listen to their stories. Both the product owner and I were positively surprised by the way people expressed things. Without going too much into the details of the discussions between team members I will shortly show and explain what we experienced during this meeting. The first person had created the following LEGO model. This model represents a group of people joining hands to build something together, representing the teamwork between the people in the team. Now the interesting thing about this one is the dog that is in the picture. A dog is associated with friendship and the person that created this LEGO structure placed the dog there to show the feeling of friendship that is present in the team and in her opinion is needed to get the optimum performance out of the team. The second model that was build shows a big complex structure in which a lot of effort was put to prevent it from collapsing. The explanation behind this is also related to teamwork and that you need it to build large complex systems. The funny thing was that while building this thing the person working on it could not complete it without any help from others because he did not have enough hands to support the structure while building. So he asked everybody to help him which further illustrates what he was trying to say with his LEGO construction. The third model showed a team of people working on a car while the customer (with the helmet) and the product owner (which is the only storm trooper figure that did not get hijacked by the product owner himself) are waiting on the side to wait for the team to finish the product so that the customer can start using it. Now the interesting part of this was the four people that are working on the car and the bricks that are behind them. The bricks behind the people represent their toolset; in the case of a development team this resembles their skills and knowledge. As you can see in the picture, the person standing in front of the car has the biggest toolset. The explanation behind this was that a person in the team felt that he had the most experience and that the other people should value his opinion, while he sometimes has the feeling that other team members feel like he is commandeering them while he just wants to help the team to achieve the best possible result for the customer. 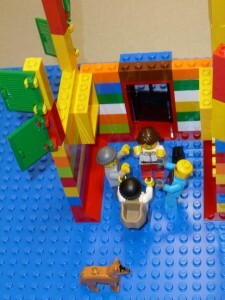 The last LEGO construction is displayed below and is showing a team surrounded by a wall and several constructed “products” outside. This image illustrates two things. First of all, between the team members there is an item that represents a flower. This was actually related to the previous explanation about the experience difference in the team. The person that created this intended to illustrate with the flower that there can be a big difference in how advice is presented to someone. The “products” positioned outside of the room represent the products that the team is working on and the fact that they are dependent on these products and the changes that happen within them. The fact that they don’t develop these products themselves but are developing functionality on top of them increases the complexity of their work. After these explanations a long but very useful discussion started about the points of view of several people in the sprint and how they can improve how they work together to become even more of a team by getting a better understanding of each other and a higher level of friendship between team members. After this retrospective the product owner, who was initially very skeptical about this approach, was really surprised at how well this worked and how it gotten subjects to the surface that normally maybe would not have been discussed so open and honest. 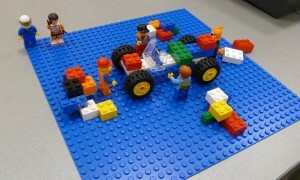 Using the LEGO added in setting a safe environment where people could express their opinions about anything. For me my mission was accomplished. Product owner convinced (and happy that he could keep the storm troopers) and it helped the team to get a better understanding of each other which in the end results in a better team. Now I am really looking forward to try this with other teams as well, or maybe even on management team level. To round it up, there is one thing I think people should keep in mind when working with things like this in a retrospective and that is not to overdo it. Bringing out the LEGO or crayons each retrospective would kill the special element you can get going with this. The advice I got from Thorsten was to find a good balance between retrospectives with regular discussions and retrospectives with play involved in it.